Find hotel near Tiger Kingdom Mae Rim Chi .. The Tiger Kingdom Mae Rim Chiang Mai is one of the popular tourist attractions in the location of Chiang Mai, Thailand. The place is ideal to enjoy a family outing as people of all age groups can get close and personal with tigers under the supervision of expert professionals. The place preserves both baby and adult tigers with care. As these tigers are born captive and have been in regular human contact from childhood, they are not as aggressive as the wild ones. You can pet these gentle tigers in a safe enclosure being guided by the experts. Kids are also allowed to be interactive here with tigers. You are guaranteed to have a great time at this park. 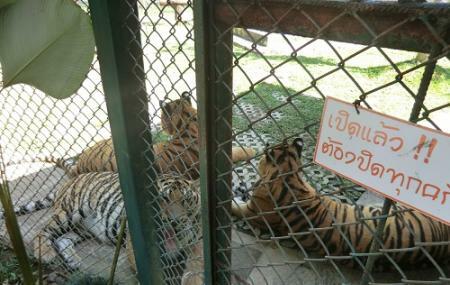 How popular is Tiger Kingdom Mae Rim Chiang Mai? People normally club together Tiger Kingdom and X Centre while planning their visit to Tiger Kingdom Mae Rim Chiang Mai.